Kawayan Charcoal Briquette is solid bio-fuel that is produced from bamboo waste using dead poles and branches from the clumps, and processing waste from trimmings and shavings. What is unique in the kawayan charcoal briquette is that the binder is effluent from the processing of chichacorn (boiled corn kernels and fried to crispy state). All the primary materials used are from wastes, which otherwise contributory to environmental problems. Charcoal has a higher energy density than biomass fuels and can be stored without fear of insects. It has excellent cooking properties: burns evenly for a long time, easily extinguished or reheated. It is used everyday in households for cooking and heating or boiling water, barbecuing, and other uses. The urban communities dominates the users of charcoals for various uses. In many countries including the Philippines rural people and charcoal producers cannot even afford to use charcoal. Therefore alternative means to produce low cost charcoal within the reach of the poor families is deemed necessary. The technology for the production of kawayan charcoal briquette is another stride towards the full utilization of the bamboo plant. With this technology on bamboo utilization another product is generated that provide additional employment opportunities in the countryside and revenues for the government. Likewise the utilization of waste from bamboo processing and chichacorn making reduce the pressure on the precious wood resource, and helps mitigate carbon dioxide emission into the atmosphere.. Demonstrate means to reduce the volume of chichacorn effluent which otherwise are contributory to environmental problems. Produce a biofuel that is environment friendly and economically feasible. Collect the dead and poles and branches from bamboo clumps. Oftentimes these materials are left to rot or burned during clearing and cleaning operations of the bamboo stands. Collect and store in plastic containers chichacorn processing effluent from the first and third washing of the boiled corn kernels. The first washing effluent contains 4.48 % TSS mostly lime while the third washing contains 3.08 % TSS mostly starch. Carbonizing is the process of converting the raw bamboo into charcoal. Charcoal is a blackish residue, porous solid product containing 85-98% carbon produced by removing water and other volatile constituents through heating carbonaceous the materials. Carbonizing can be done by the drum method and cool-off the charred materials in closed metal containers. An alternative to the drum is the pit method. Dig a small pit approximately one meter sq and 0.5 m deep and place the raw bamboo materials inside. Start firing at the bottom and little by little cover the pit with rice hull until fire is extinguished. Check frequently until materials are charred. Cool–off charred materials in metal containers. Shred or pulverize the charcoal to attain even sizes of particles. This will make even mixing of the binders and the charcoal fine particles. The machine used in this project is a peanut sheller converted as shredder. 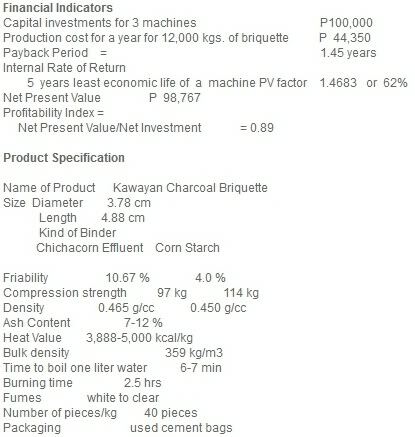 The Kawayan Charcoal briquette technology recommends the use of Chichacorn effluent as binders. This is a cheap material because it is a waste. Mix 2.5 liters of effluent to one (1) kg of charcoal. In areas where effluent is not available use corn starch as binders. Use 6 % mixture, this means that one kg of bamboo charcoal needs 60 grams of gelatinized corn starch. The weight of water needed is 60% of the weight of the raw material. Mixed thoroughly the bind er with the charcoal and mold immediately. In this project piston type molders were used. The briquettes were compressed at 24 kg/cm2. Dry the briquettes under the sun for 1-2 days. Continue drying under the shade until it reach equilibrium moisture content (EMC). Pack the briquettes in convenient weight and size. For the 3.78 cm D x 4.88 cm L briquettes approximately 40 pieces can be contained in one kg pack. Wrap the briquettes with used cement bags which can be lighted to start firing the briquettes later. Production is estimated at 12,000 kg of briquette a year and is limited based on the bamboo wastes generated by the Bamboo Processing Plant which is estimated at 160 kg a day or 46,080 kg a year (i.e., 288 production days in a year). Selling price per kilogram (40 pieces) of briquette is P10. Q1.how many kawayan briquettes can be made from 1 kawayan pole? Q2. how many grams of cassava binder can be made from 1 kl of cassava.? just needed for the business plan. thanks.. Please send me an email. ayaw kasi mag send dun sa naka post na email address baka po nagpalit na kayo. Gusto ko po malaman kung nag sseminar din kayo sa Manila.